Wild: Equus Magnus appears to be an ancestor of the modern horse. Based on its stripes, it may be the African Variant of Equus Giganteus, which appeared in North America during the Ice Age, but that is pure conjecture. Its behaviour in the wild is similar to that of other wild members of the Equus genus - it sustains itself by grazing, while keeping safe from predators by living in herds and outrunning its attackers via superior speed and stamina. Domesticated: Horse and man have long been partners in survival, and this remains true on the Island. 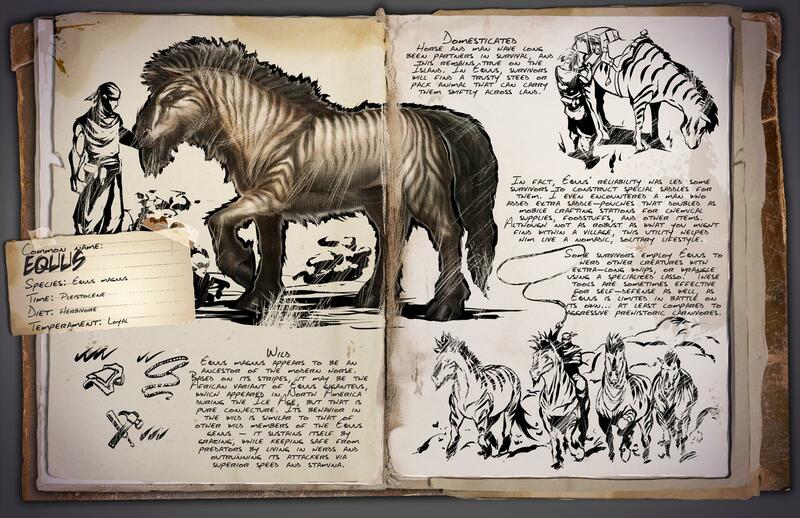 In Equus, survivors will find a trusty steed or pack animal that can carry them swiftly across the land. In fact, Equus’ reliability has led some survivors to construct special saddles for them. I even encountered a man who added extra saddle-pouches that doubled as mobile crafting stations for chemical supplies, foodstuffs, and other items. Although not as robust as what you might find within a village, this utility helped him live a nomadic, solitary lifestyle. Known Information: Some survivors employ Equus to herd other creature with extra-long whips, or wrangle using a specialized lasso. These tools are sometimes effective for self-defense as well, as Equus is limited in battle on its own… at least compared to aggressive prehistoric carnivores. Hello I would like to know how to make it spawn? I would love to tell you, but it isn´t released yet – so it can´t be spawned. When will the Equus be sended out to Xbox ONE?